You need an effective web site. We blend art and science to design small business web sites that convince your customers to buy. We know the psychology of why they buy. We use that knowledge to help you be as profitable as possible. Put our 26 years of experience to work for you. Contact us at 716.332.6147 for your free consultation. Why choose WebTY's? "WebTY's has absolutely given me the tools to succeed in this fast high paced environment. 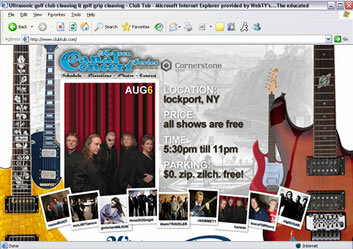 Before I came to WebTY's I had two other web design firms design my site. While they made some improvements, the site just never reached my expectations. I contacted WebTY's, and after talking to them many, many times (I'm sure they were ready to kill me), I took a leap of faith and went with them. They had many obstacles to face, including a less than cooperative ex-web designer who attempted to throw a glitch in anything he could whenever he could. The team continued to chug along even with me asking every hour on the hour when it would be ready. They were always courteous and professional and they finished it up within the time frame allowed. After it was up we were successful from the beginning! We beat the best month of the old site by over 200% and continue to gain more and more ground each day! WebTY's is THE premier web design team in the nation; I'm convinced of it. Web design is not just making a web site but involves marketing, psychology, and a little luck. WebTY's has got it all going for them. I'm the most cautious, most optimistic person there is, but WebTY's has convinced me that they know what they are doing." "I needed a company that can contribute ideas that would complement my vision. I found that partner in WebTY's." Need a specific site style?